I hope you all had a good Holiday season and that 2014 is treating you well so far. I had a lovely Christmas, staying in a house in the country and cooking Christmas lunch in an aga – a very different experience indeed! I have to say, the slow-roasted turkey that my sister and I created (15 hours in the aga) was amazing! Tender and delicious! Anyway, I know that I’m a bit late with this post (I should really have posted this before Christmas, but you know how busy a time it is). Now you have it well in advance for next year! Before I went grain-free, I always loved the flavour of Christmas pudding, but I must say I found it terribly stodgy and ridiculously filling/bloating (maybe that was partly to do with the fact that it always came at the end of Christmas lunch during which I had stuffed my face!). This Christmas pudding however has all the delicious, boozy, fruity, spicy flavour of a traditional Christmas pud, but a lighter texture. I can honestly say, I much prefer this version to the original and I have even converted a few people who never used to like Christmas pud! If you don’t like a lot of booze, you can certainly lessen the quantities (or omit it altogether). Put the raisins and sultanas in a bowl, cover with the booze and leave to soak for a few hours or overnight. Place the prunes and dates in a jug, cover with boiling water and microwave for a minute or two until the water is boiling and the fruit is soft. Drain off the water. Purée the prunes and dates in a food processor and leave to cool. In a large bowl, mix the eggs, puréed prunes and dates, spices, vanilla, zest, orange juice, salt and bicarbonate of soda. Add in the flours. Finally, grate the frozen butter and add into the mixture. Grease your pudding basins and set up your steamer(s) or slow cooker. Steam (or slow cook) your puddings for around 4-6 hours. Leave to cool and then refrigerate for up to a week and a half until Christmas Day, or when needed. Before serving, steam the pudding for a couple of hours. Turn out onto a plate and decorate with holly if you like. Pour a tablespoon or two of brandy into a metal ladle and heat over a burner until warm. 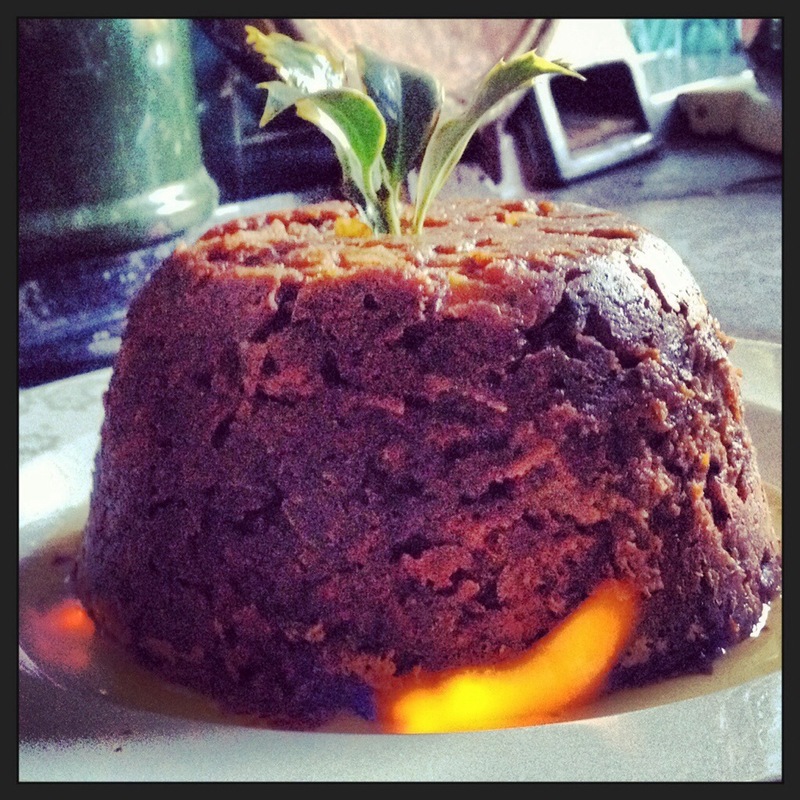 Ignite the brandy and pour flaming liquid over the pudding. Keep spooning it up and pouring it over the pudding to keep the flames going while you wow your guests or family! Be careful not to burn yourself or set fire to your house in the process! Serve with homemade brandy butter, brandy cream or regular heavy cream (if you are Primal), or whipped coconut cream for a truly decadent but delicious Holiday treat! Posted in Treats and desserts and tagged allspice, almond flour, apple, brandy, carrot, Christmas pudding, cinnamon, cloves, coconut flour, dates, dried fruit, gluten-free, grain-free, grass-fed butter, paleo, primal, prunes, raisins, rum, sultanas, whole-foods. Bookmark the permalink. I know it’s not Fall anymore and I should get over the pumpkin recipes, but I just can’t get over my addiction to the orange stuff! 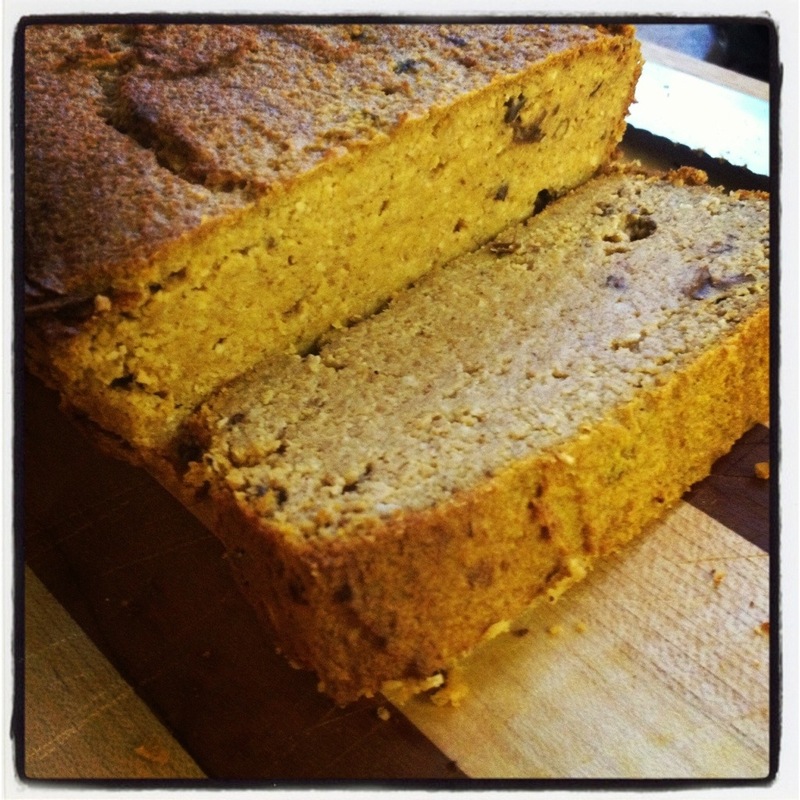 Living in the UK, we don’t get bombarded with all the delicious, creative pumpkin recipes that you do in the States. Therefore I always feel hard-done-by on the pumpkin front. The only people who understand my obsession with pumpkin are my mum (who is American), my sister (I guess it runs in the family) and my man (who is Canadian), oh and a few other American and Canadian friends. My dad has grown to like pumpkin over the years, being force fed it by my mum, my sister and I. He really enjoyed this pumpkin loaf I made last week while I was staying at their house following my mum’s surgery. I really don’t care that it’s not Fall anymore! It still feels like winter here in Old Blighty (that means England, by the way), so the blend of warming spices still feels appropriate for the time of year. When it starts to feel like Spring, I might hold off on the pumpkin for a while…nah! Blitz the prunes, eggs, pumpkin, banana, vanilla and coconut oil until well mixed. Stir in the spices and flours, mixing well to form a thick batter. Pour into a greased and parchment lined loaf tin. Bake in the oven for 40 mins. Allow to cool completely before removing from the tin (or it will crumble). Serve sliced with a slab (or a small scraping) of grass-fed butter on the top! Delish! Posted in Treats and desserts and tagged almond flour, banana, cinnamon, cloves, coconut, coconut flour, coconut oil, eggs, ginger, gluten-free, grain-free, low carb, nutmeg, paleo, primal, prunes, pumpkin, sugar-free, vanilla, whole-foods. Bookmark the permalink.